Martinsville, Virginia - Barbara ‘Little Doe’ Adkins was a women I was highly interested in meeting after exchanging email a few times. As a college student of photography I’m in a class for Visual Arts, the assignment was to find an artist of our choosing. Being a Native American Traditional Women Dancer in Virginia. I know where I was going to find my Artist. But first, I had to put out a call for any Local Native artist on a web site call Virginia_First_Peoples asking for volunteers. Barbara ‘little Doe’ Adkins was the one to respond to my call. So my journey was on, she informed me that her medium was painting, sketching and of course crafting. For now the crafting was what I wanted to focus on. Barbara ‘Little Doe’ Adkins works at making Pine Needle Baskets. Looking at one of her baskets you find that she has the sense of the people. Barbara baskets are rich in color but yet have the warmth of the earth. You can feel the spirits from each one of her works of art. Having met with this woman of the people she brings back the days of yesterday. Things that we have long forgotten. I highly recommend that if you just so happen to find your self at one of the powwows in the Virginia area please visit with Mrs. Barbara ‘Little Doe’ Adkins. She greets you with a smile that said she glad to have you with her. After just sitting with her for a few minutes she was more then willing to answer any question that I may have. I all ready know what question I wanted to ask Barbara before I met her just by looking at her art work on line. I could see the women with in the baskets and know just what to ask her. I wanted you the reader to see what I see and to feel what I was feeling with in her art work. 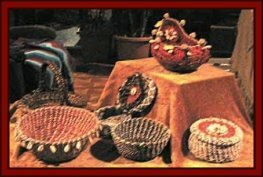 So let’s relax set back and let Mrs. Barbara talk about the beautiful art work called Pine Needle Baskets. What was your course of study to prepare you for your field? Did you take Classes in basket weaving? Actually, I never took a basket making class. Everything that I have learned came from books and the internet. 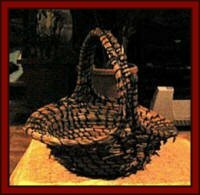 Was the art of Pine needle basket weaving handed down from mother to daughter? No, but the sewing did which is used in the basket making. As well as the art and music. 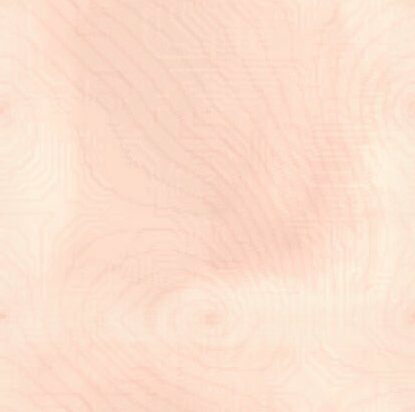 I understand that you use pine needles from the surrounding forests of your home. When you look for the pine needles what type of needles are you looking for? I look for the longest pine needles and for the new fallen ones. If you can find a deadfall. Then the pine needles are already off the ground and are easier to gather. The new fallen ones are newer looking and have a beautiful brown color. From what I can see of your baskets, do you use dyes to come up with the different colors? I have used Rit dye and dye from the natural berries, like pokeweed, blackberry and various leaves. If you do use dyes, what is the types use? And how do you come by them? The natural berries can be found in the woods surrounding my home. The pokeberries are picked fresh and stored in containers and stored in the freezer. I use them as I need them. I also store beet juice and blackberries the same way. The brown shades are from the Black Walnuts. I can boil the hulls and the shells to get the desired shades. 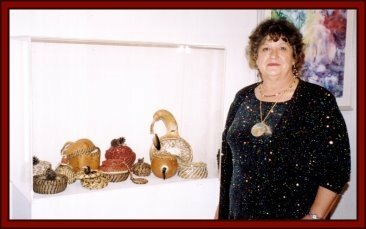 Barbara from looking at your breathtaking baskets, I was wondering what gave you the Ideals to incorporated thing such as shells and pine cones in to your work? Boredom. I got tired of looking at just plain baskets and decide to embellish them. I saw different styles of embellishment in some of the books and online. I ask only because many of us in the Native American Community believe in Dreams and Visions. Can I ask your view point? Dreamtime is the time between sleep and awake. This is the time when we are closest to the Creator. This is the time when we hear His voice. During the awake time, we are generally more preoccupied with the trials and chores of everyday life and are unable to pay attention to His words; therefore we are not open to His words. Listen to the dreams, write them down and the meaning of your dreams will be made clear in time. When we get an intuitive feeling, I believe that our senses are hearing His voice and that He is guiding us. This is my belief. Barbara, I do a little bit of art work myself and being Native I like to only work on that piece when the spirit moves me to help guide me. One piece may take a week to work on but then it could move on for years. Do you find that the spirits guide you in your work? 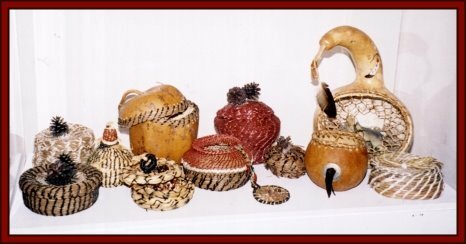 Definitely, there are times when an item, a gourd, basket or painting, or even a sketch, that I am amazed at what the spirits have brought forth. I have even found my hands moving as though unseen hands have guided me. Those times and the results are fantastic. Then I know that my work is a gift from the Creator. Those times are magic. Barbara, if I may ask can you tell a little about your self and how you started showing your Baskets at powwows? Well, I am 58 years old. I am married and we have 5 children. And 10 grandchildren. I began painting again in 1997 after having surgery on my shoulder. 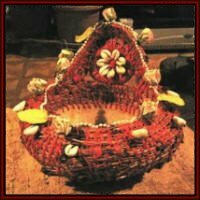 The baskets, I began around the first part of 2004. I had seen a photo of one online and fell in love with them. Naturally I did some research on them and the results are what you have seen. Do you show your work at other art showing like Gallery’s or The Seawall Art Show in Portsmouth? My work is on display at Miss D's Framery in Gloucester, VA on Route 17. I have work entered in the Rappahannock Art show this month and I show at the Art League of Gloucester Art shows during the year. They have also been on loan to the Cancer Center hospital here in Gloucester. Barbara can I ask, what is the most rewarding part of your art work? Sharing knowledge, teaching the children of the Native American way of life and their heritage. Barbara, if I or others wanted to learn how to make pine needle baskets what would you recommend us to study, to get into this field? And you are able to print out detailed instructions on them. I understand that you show your art work to students at local schools? Can you tell us the reaction that you get from the students? Are they inspired by your work? Feel free to correct me if I’m wrong. 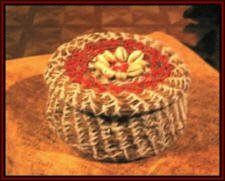 So far, I have not been to the schools, but have taught several classes on the pine needle baskets. My reaction has been wonderment at the way a simple pine needle can be woven into a basket. Barbara, with this being the computer age do you put any of your ideals on the computer? Oh, yes, oh, yes, my computer is another tool that I put to work. I don't know what I would do without it. It is like a library at my fingertips. What Tips or words of wisdom would you give a novice such as myself? Read all that you can of our histories. Study the how and why of what they did to live and try to place yourself in their minds as to the choices they had to make, and the items they had at hand to use. Sit quietly in a meadow or the forest floor and listen to the little sounds around you. Only then can you feel the spirits of our ancestors all around and if you listen closely, you may hear the voice of the Creator. studying in both fields. As well as a Native Traditional Women Dancer.